Samsula, Florida - March: Story and pictures by staff photographer Michael Odom. 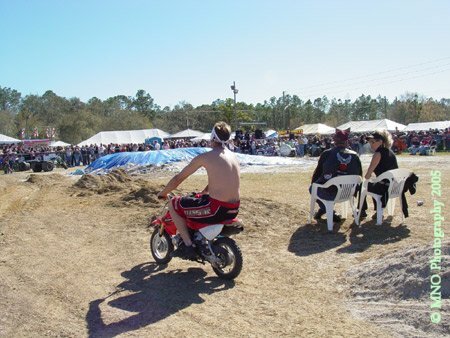 As the crowds began to thicken for the rescheduled Saturday coleslaw wrestling at the Cabbage Patch Bar, I took a moment to get a few pictures of FMX motorcycle stunt rider Kenny Yoho. 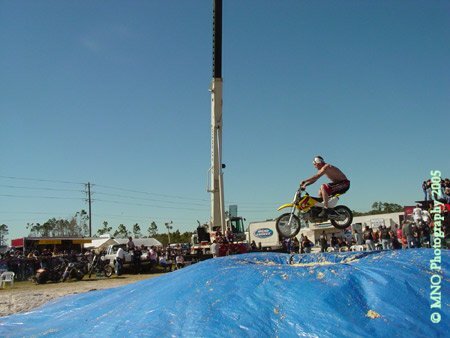 I thought it would be a cool if Kenny would do a freestyle motocross stunt without the aid of a ramp and jump over the coleslaw pit where the women were getting ready to compete for the $500.00 first prize. 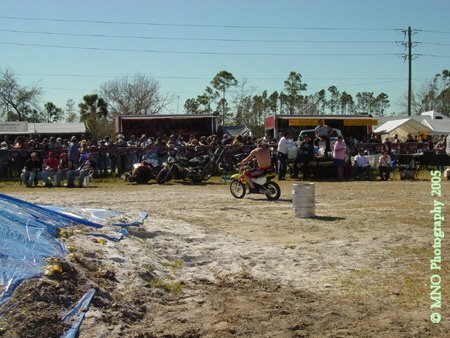 The Cabbage Patch Bar is world famous for this event that is held during both Bike Week and Bikertoberfest® each year. To my knowledge no one had ever pulled off this stunt. Kenny smiles as he poses for my camera, but he still has not made up his mind if he wants to attempt this extreme stunt that I have conjured up in my head. I was still coaxing him as I pulled my camera up to take another picture. By the look on his face I am thinking " he is going to do it" . But still no commitment from the 27 year old from St. Petersburg, Fl. 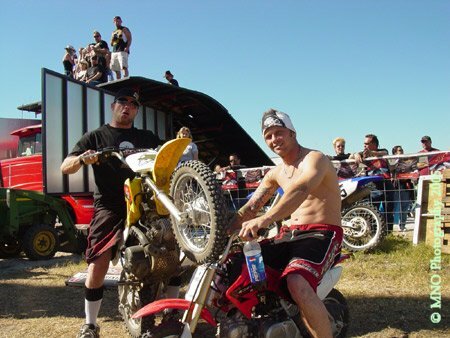 Kenny's friend and fellow stunt rider Jason jumps in for a picture and Kenny suggest to him my idea, but with a twist. Kenny suggest that Jason do it rather then he. Jason says " no way, but I will watch" . Now I am wondering if I will have time to get this stunt under way before the wrestling match begins. So, I start pushing a little harder for the accommodation to my stunt request. Great! Kenny has decided that he will do the stunt for me and tells his Jason to keep an eye out for security and to make sure the unscheduled event landing area is kept clear. I check my gear and make sure that I am going to be properly positioned to get this action shot. In a stunt like this, especially when it is unplanned and never been tried before the timing has to be right for both the rider and photographer. 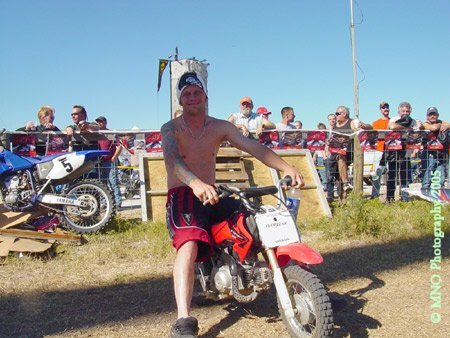 I knew that I would not get a second chance as I watched Kenny ride off to jump the pit. I needed to get into position and be ready as the bike hit the air. The ground was rather torn up and had big mounds from the previous event the bike pull. But, I knew that he would be able to locate a good entry point for the stunt. Kenny gives final instructions to his teammate on watching for clearance and security. 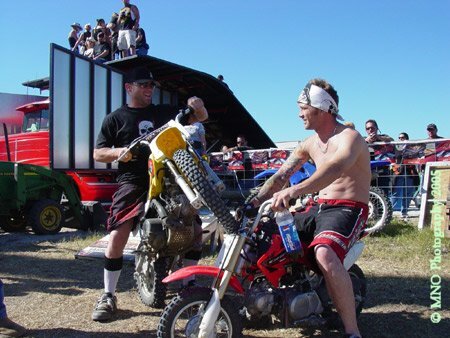 We had no permission and this stunt was totally an unscheduled Bike Week event. I was getting a little nervous about getting this done before the main event and time was getting short. The crowd really had no idea what was about to happen as Kenny warms up to jump over the wrestling pit freestyle. The stunt, if pulled off would mean jumping over an estimated 30 ft. filled with a ton of ground up cabbage without the aid of a ramp. 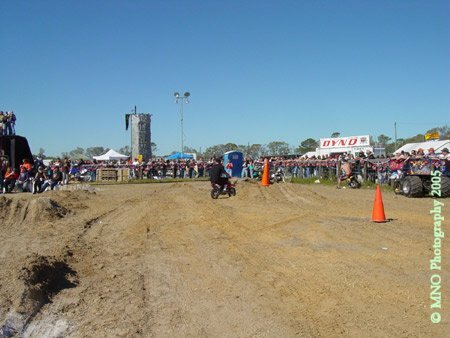 The incline of the pit mound varies and could only be guessed by the rider. 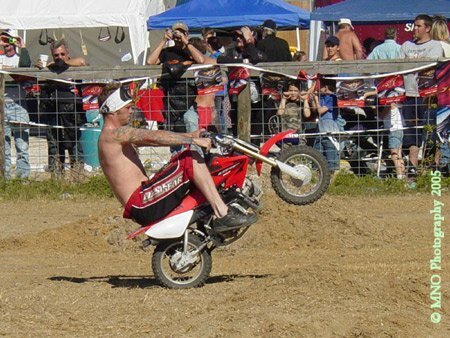 My concern was the weight of the rider on this mini sized dirt bike attempting this stunt. I guess Kenny figured the same after sizing up the length and height of the pit, so he switches over to a larger scale bike. Kenny rides around the pit trying not to arouse suspicion of the bikers lined up around the fence and security on watch inside as I get into place to document this first time stunt. Meanwhile, our own security is on bike patrol making sure that no one wanders into the landing area that has been pointed out to him by the rider. The stage is almost set for the jumping the coleslaw pit stunt. The crowd's eye has been turned by sideline happenings as we grow closer to the moment. Kenny has a final look at the area of interest while sizing up everything else that is going on around him. I am sure that doing a stunt for the first time can make you a bit nervous. But, there is also a good deal of adrenaline rush that goes with it. I was moving to the area that I had picked to get the shot. It appears that one of the women wrestlers is pointing out to (two dollar Jim) the referee of the match that something is amidst. Our roving bike patrol checks out the situation for possible conflicts. Now, the crowd's attention is starting to be brought back center ring and I am hoping that we can still pull this off undetected. OK, now we are committed! 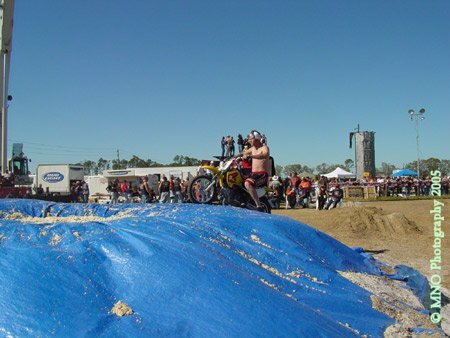 Kenny rides up the mound of the pit filled with coleslaw in final stunt preparation. 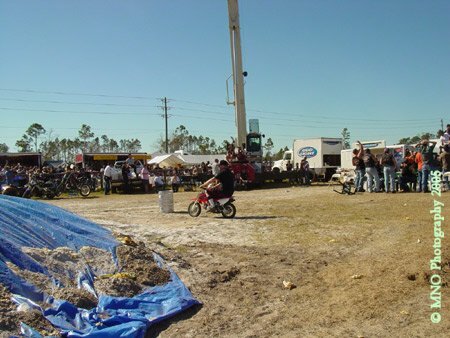 If we can get this done it will be a exclusive www.bike-weekdaytona.com and one shot try. It looks as if it is a go folks. He is in the air and clears the pit! The stunt went off without any incident and was a success. 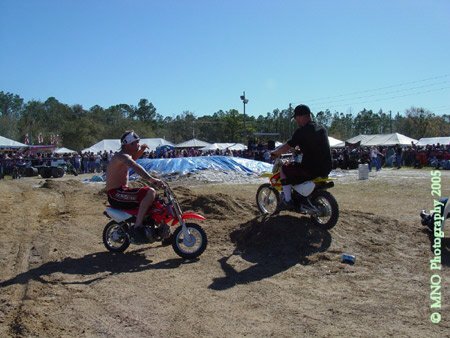 What a historical moment at the cabbage patch bar for Bike Week 2005. 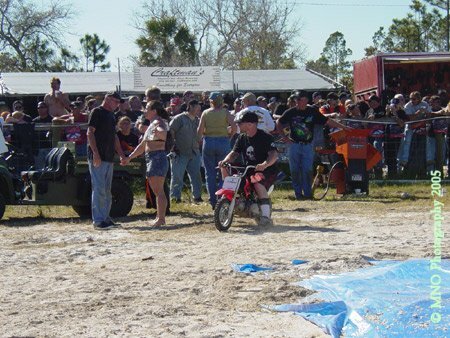 Kenny Yoho has successfully jumped the coleslaw wrestling pit on a mini dirt bike.